This tapestry 'Balcony View of the Villa' captures a view of the luscious Tuscan countryside from a balcony opening. 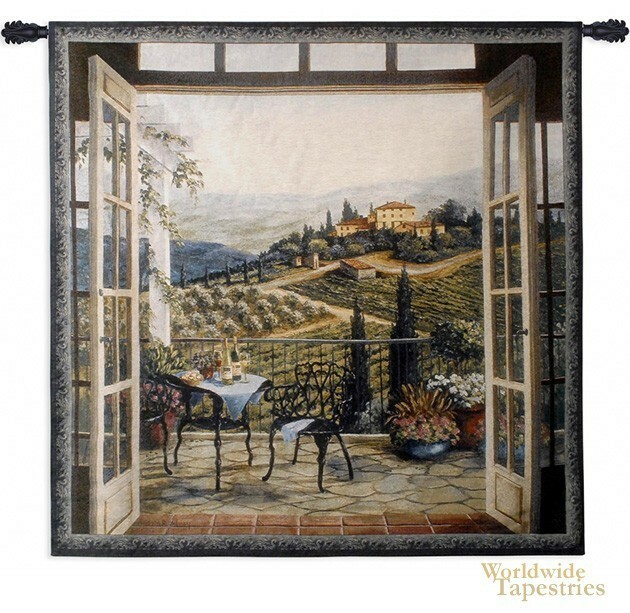 Based on a work by artist Barbara Felisky, this tapestry is typical of her love of idealistic landscapes from France and Italy captured in beautiful detail and color to give the impression that you are standing right before the scene. With the opening balcony doors in this tapestry this illusionary effect of being transported to the countryside in Italy while you are standing in a room in your home looking at this tapestry is even more accentuated. The eye is gently led from the focused detail of the lovely balcony setting to the distant hills and beyond. Her works depict the natural beauty of the countryside in a variety of countries all around the world and this work depicting this scene of the Tuscan countryside is no exception. This tapestry is lined and has a tunnel for easy hanging. Note: tapestry rods and tassels, where pictured, are not included in the price.